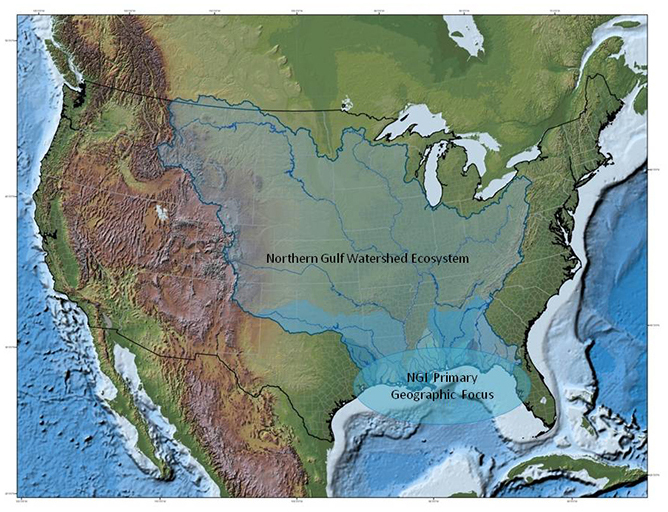 The NGI defines the Northern Gulf of Mexico region as the upland, watershed, coastal zone, and coastal ocean areas from the Sabine River in Louisiana east to the Suwannee River in Florida. This region is a rich and interdependent natural environment of great complexity vital to the Nation. The riverine-dominated Northern Gulf ecosystems are under pressure from increasing population and coastal development, impacts from severe storms and climate variability, inland watershed and coastal wetlands degradation, and many other factors.